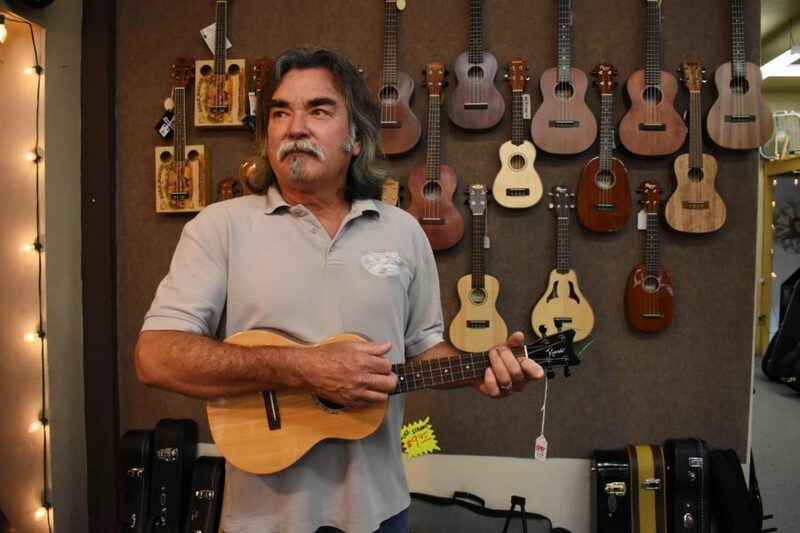 Roy Good plays ukulele inside the shop he has been working at for over three decades. The year is 1983. The music scene is blossoming in the quaint little seaside town of Carlsbad, California, as children and adults alike strive to learn to play music like their artistic idols. The door to the small-town music center known as Giacoletti Music jingles as a young Roy Good steps inside. Little does he know, he will spend the next three decades building up the retail business here and nurturing a community with a deep appreciation for music. Good had worked with one of the owners — Mr. Giacoletti — before, and was aware that while the music school was thriving, “they had nothing going in retail.” So he walked in with his experience working in guitar exchange in the seventies and a determination to build a music store up from the ground. 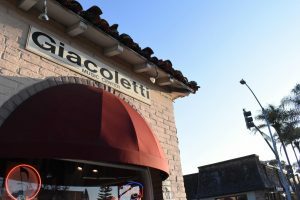 Thirty-seven years later, Giacoletti still stands in the heart of Carlsbad Village, pulsating with life and music. Classic rock hums in the air, mingling with the buzzing conversations of the customers. A collection of ukuleles and guitars in all shapes and sizes from all around the world is displayed along the walls of the little shop. The island-like tone of a ukulele is likely to be heard as a man with long hair and a beard, clad in a colorful Hawaiian shirt and flip-flops, tests instruments to the delight of a lucky customer. This man is Roy Good, manager of Giacoletti Music Center since 1983, a year after it opened. Good has had a passion for music since the British Invasion hit. This combined with his love for surfing led him to a charming little music school located in Southern California. Good breathed life into the little shop and it has flourished under his guiding hand. He has found his place following a path he paved with passion in mind and sculpted a life dedicated to doing what he loves. Good was drawn to the ocean and laid-back lifestyle of Carlsbad, and after following advice he grew up hearing from his father, decided it was home to him. Roy Good plays a tune on a ukulele, one of his favorite instruments. The idea that happiness comes from appreciating the little things is clear in the way Good lives his life. A sense of thankfulness is apparent in his everyday life; from biking to work, to talking about his wife, to helping a customer pick out the perfect instrument for them. “Doing this you aren’t going to get rich, and I’ve been fortunate enough to accomplish 99 percent of what I want and being able to work here all the years I’ve been here,” Good explained with gratitude. Just as Good does not take his blessings for granted, the music store does not take Good for granted. Employee Jared Bliss, who has worked at the shop for 13 years and learned everything he knows about guitars from Good, spoke of his mentor with admiration as he manned the shop in the late afternoon. Ukuleles are one of the instruments that Good treasures wholeheartedly, so it is no surprise he has rallied for their exposure. Senior Tina Stanley has seen Good in his element, playing the ukulele in his shop and commented on his talent. “I watched him play ukulele one time and he was really good,” Stanley recalled brightly. Stanley used to be acquainted with an employee at Giacoletti and has visited the shop a fair amount of times. To her, Giacoletti represents a place for those who hold music close to their hearts. Like most of the people in his generation, Good became immersed in the music scene during the reign of the Rolling Stones and The Beatles. The inside of Giacoletti is plastered with vintage posters and is never without the murmur of classic rock in the background. This tribute to the sounds that laid down the foundation of Good’s love for music honors musicians of the past and influence musicians of the future. Good started playing guitar in elementary school, but it wasn’t until college that he realized music would be the center of his life. Out of all the many memories Good has of music’s influence on his life, the one that he holds closest to his heart happened when he was in middle school. “Back when I was in eighth grade I went and saw the Paul Butterfield Blues Band [on their] East-West tour and … it was a blues band and I saw them at the Golden Bear in Huntington Beach and it just made everything [make sense],” Good said with a nostalgic look painted across his face. Good has a natural talent for music apparent as soon as you see him on the guitar or ukulele. He once taught himself bass guitar over the course of two weeks. He took these skills and joined a band he still plays with today. “[I play] bass guitar, guitar and ukulele. Back in the early ‘80s, like in 1982, my friend said ‘Hey Roy, can you play bass,’ and so I said ‘I think so,’ so I took one off the wall in the shop, went home and worked on it for two weeks and auditioned for a band, got into the band, and I still … play with several of the guys in that original band,” Good said with a good-natured laugh. Giacoletti is more than just a music store, it is a school too. The owners had opened it with the intention to grow the love of music in the town, and this mission still stands today. Good has a high regard for the teachers and his eyes crinkled with a smile as he spoke about the people he has worked with for so long. Back in the ‘80s, Good taught in the music school pretty often. Nowadays, he comes in on demand and likes to stick to the ukulele. 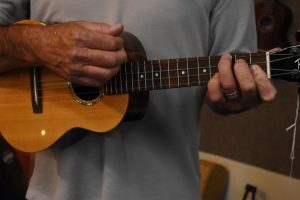 “I [taught] a lot in the ‘80s and now I mostly [teach] ukulele workshops [out of demand for the lessons],” Good explained about his role in the music school. The smooth-running shop has not been without any bumps in the road. Good remembered the challenges as well as the good times of the shop, acknowledging that, with changing times, the shop has had to change. Giacoletti opens in the lull of the mid-morning and stays open deep into the evening, closing after the night sky has fully darkened and the stars are bright, while satisfied students make their way home. In the years to come, Good hopes for Giacoletti Music to continue growing a love for music in the community while remaining a place of positive vibes. “[I hope] to continue… educating the young people … and being positive, a positive [influence] in downtown Carlsbad,” Good explained on his future hopes as manager of Giacoletti. Giacoletti Music Center sits in the heart of Carlsbad Village. This shop has become more than just a store to the community. It beats with the life of the people in the center of the village and provides a place not just for buying instruments, but for advice and assistance. “People know that we are not just a guitar shop, people come here for us to help them find things and so we will help them choose what they want to do or keep moving forward musically,” Good asserted happily. The shop is located on State Street in the middle of Carlsbad Village. It is open from 10 a.m. to 6 p.m. on most days and if you are lucky, you may come across the weathered surfer turned musician that has impacted the musical life in our community. The year is 2018. For over 37 years Good has been opening the doors of Giacoletti to the community, sharing his love for music with a lively spirit. A young Good is somewhere inside him smiling with pride at what he has accomplished while staying true to the beliefs that make him such a positive member of the community. Let us take a lesson from Good and believe that if we follow our passions in life, we may never be without happiness.